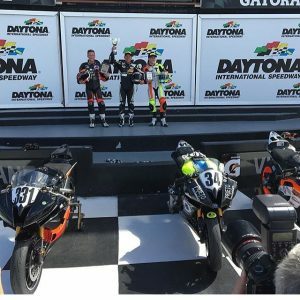 Kaleb De Keyrel Wins 6 races at Daytona on his Anderson Racing R6! 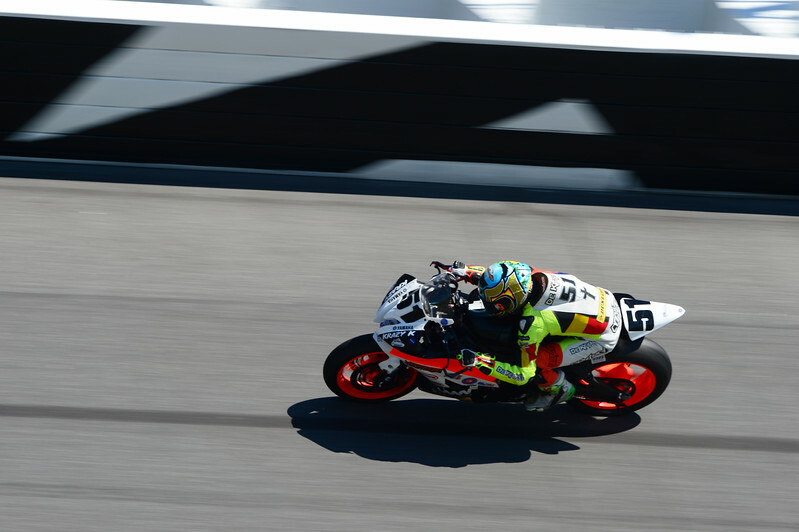 Daytona started off great with a couple rounds of practice. We did most of the fine tuning with the suspension when I rode the bike last October so really practice was just getting used to the track again. I was on a brand new Yamaha R6 that was just built and had never been ridden so we just made sure everything was good to go. 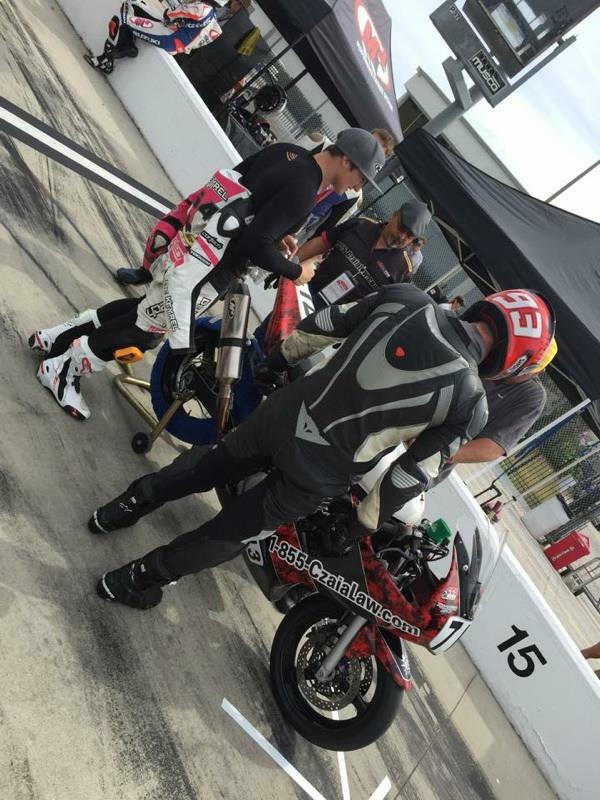 I loved the set up on the bike pretty much right off the bat so we made some small tweeks and got ready for the first qualifying round for the 200! I was absolutely pumped to be running this race with such a great team behind me! Friday, We had 3 qualifying sessions for the 76th annual Daytona 200. I was feeling really good on the bike after the first qualifying session but we were just off the pace a little bit. I needed to find that .5 second that was so hard to find when you are pushing your all out hardest to go faster. 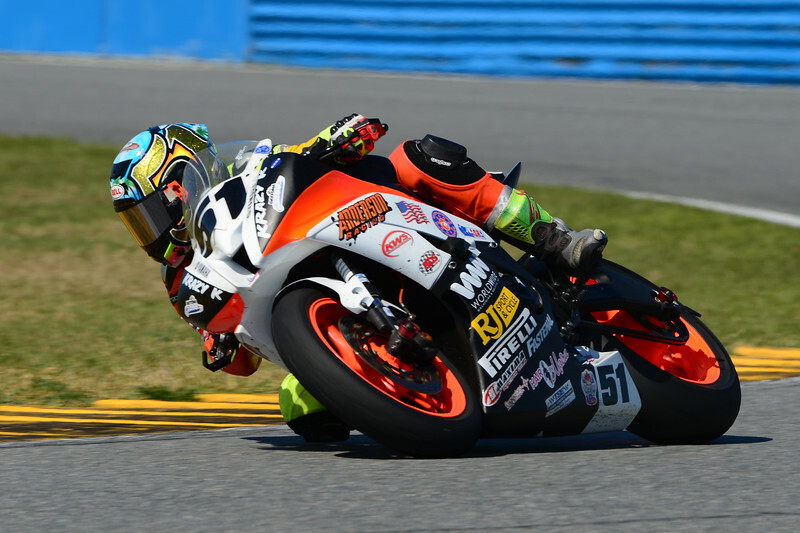 After the first two rounds of Daytona 200 qualifying we had to go right into qualifying for the ASRA races. 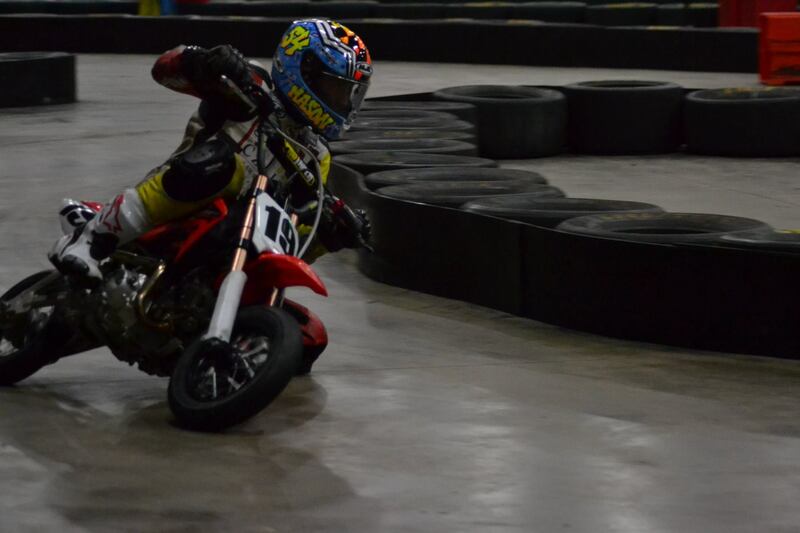 I went out and qualified 5th on my 600cc against the 1000cc machines. 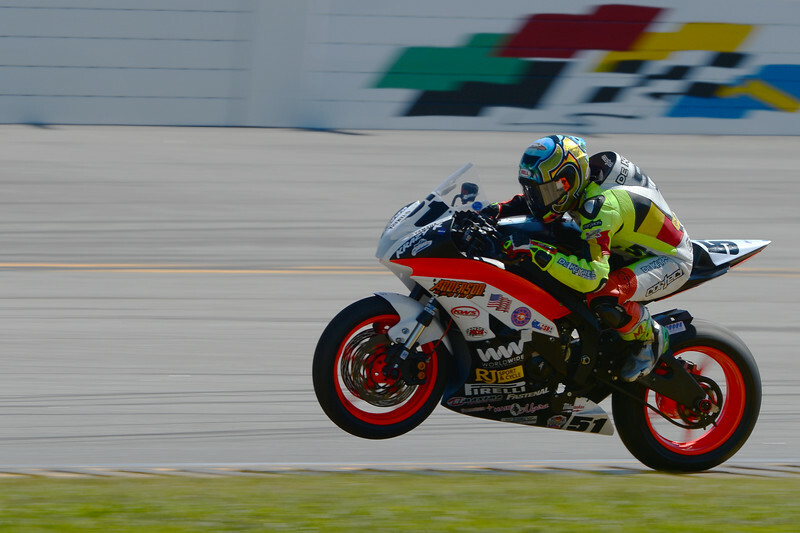 Next up was qualifying for the 600cc ASRA class. I knew I needed to just throw down one fast lap. So I calmed down and just focused on my marks before qualifying started. This qualifying session wasn’t as important as the next 200 qualifying would be but I knew this was a perfect opportunity to get a little more track time in before the next 200 session. I had a couple spots where I knew I could make up a little more time in the back section of the circuit. Because I can tell when I’m gaining or losing time from my lap timer. Every lap I came around my lap times were dropping 53, 52, 51. I knew that was my new personal fastest lap and time was running out I was hoping that was enough. 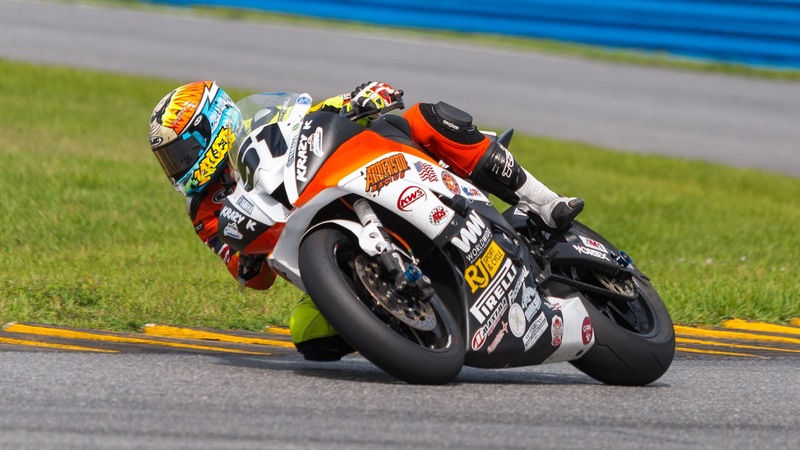 I qualified POLE for the ASRA 600 race and then turned around in the next session of the 200 qualifying matched that time again but I was searching for a little more. I qualified 10th with a 1:51.660 for the 200 but I wasn’t to worried about it I’m a racer and I always race better than I qualify. Also I know a lot can happen in 57 laps and we needed to be ready for anything! Saturday, I got a great nights rest and was ready to attack the day I had been waiting a long time for! It was race day! 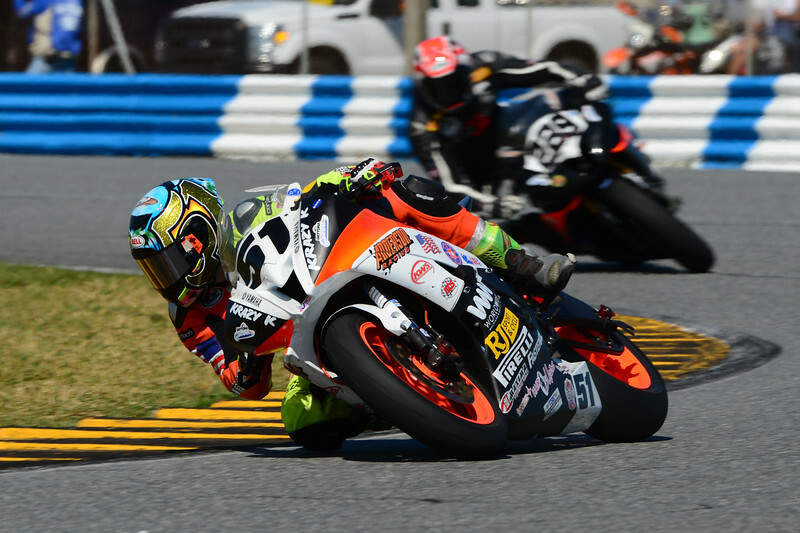 I was pumped up and ready to get after my first 200 mile race at Daytona! Started off with a little warm up then an awesome fan walk with the fans. Got to sign a ton of posters and meet all sorts of people from different countries who were there to watch the race it was awesome! This got me even more excited to be a part of a race with such rich history. 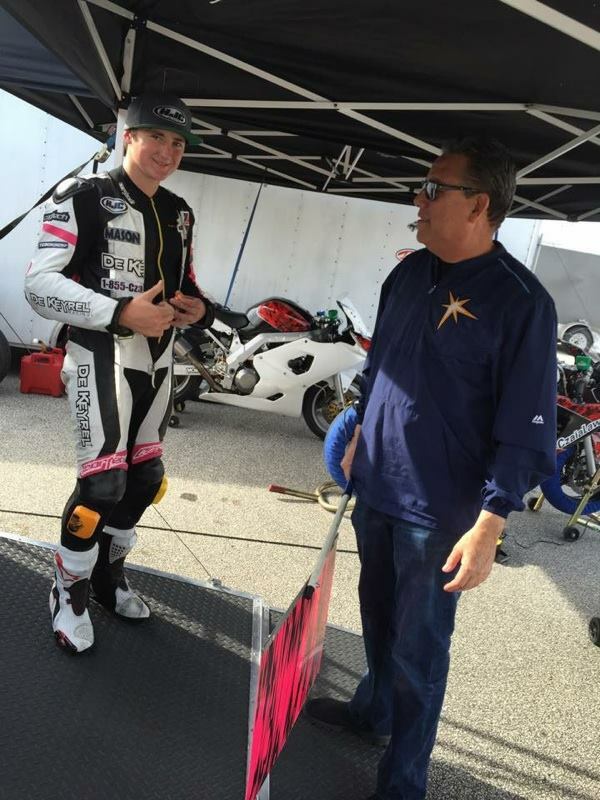 I put my leathers on super quick and started to get in my zone before the race. I like to listen to music and go through the track in my head. But before you know it, it’s go time! I’m on the grid nothing but you and bike vibrating below. The board flips 1 to 2 and BOOM! The flag drops and the race is on! I got a pretty good start and was right up in the mix but we didn’t even make it a lap and the race was red flagged. This would happen 2 more times before we actually got racing. Unfortunately with all the restarting my clutch was starting to slip and it was continually getting worse. I had no Idea what I was going to do the clutch was slipping so bad that every time I shifted it would just rev all the way out. I was telling myself just try to stay out one more lap and as soon as I said that there was another red flag. I knew I had to get back to the pits as quickly as possible so my crew could get on it right away. So I rushed back to the pits as fast as I could and told them we were going to have to put a new clutch in! They frantically started to take the bike apart and they did a great job getting it back together but we we’re just a tad bit late. At this point when the flag dropped and all the racers went flying by. My bike was still in pit lane getting the belly pan put back on and some other loose ends. I told myself well this what you’ve been training for man. You better go out there and make it happen. I just put my head down and pushed went as fast as I could go for the next 57 laps and ended up passing 52 people to take 6th in my first Daytona race! I was pumped there was so much adversity with the clutch issue and I had to come into the pits again and do a stop and go penalty for some violation in the pits in one of our pits stops. Overall I think we did a great job with everything that went on and I can’t thank my crew enough for getting back on track after that first red flag. If they wouldn’t have been able to get that clutch back together my race would have been over! Sunday, Was my day to relax and have fun after all the stress of the 200 was over I just wanted to go out and have a ton of fun! 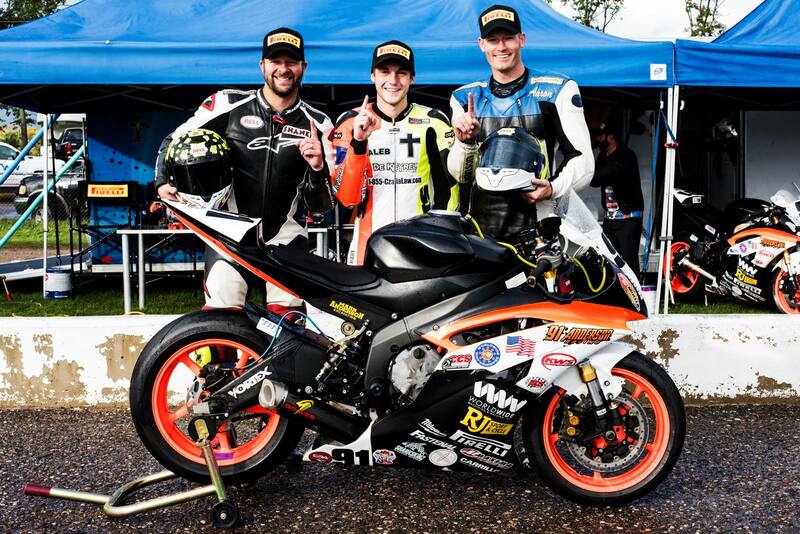 I started out the day by winning the ASRA sportbike 10 lap race which was a ton of fun! After the first set of races in the morning there was a lunch break. Before the lunch break my buddy Raymond Rizzo put on a great church service! After that is back to the action! 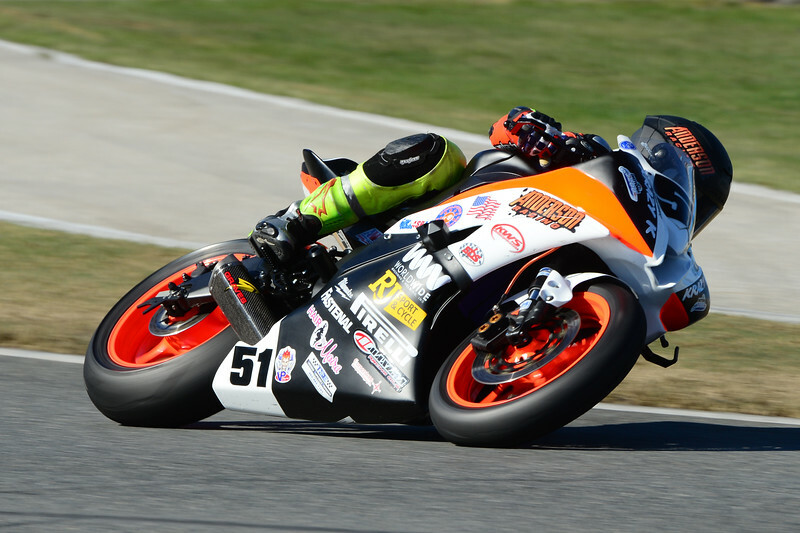 I really wanted to get on the 660cc Superbike with 160 HP with 60 Ft Lbs. of Torque. John Anderson and KWS motorsports have spent so much time working on this project I couldn’t wait to get my hands on the beast and see what it could do around the high banks of Daytona! Once we got the suspension set up on the bike I absolutely loved it! It had so much power it was hard to keep the front end on the ground. 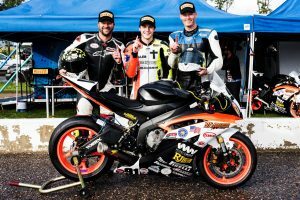 I ended up winning all of the next 3 races on this amazing bike to finish out an awesome weekend at Daytona! Also did some testing with pirelli and found an awesome set up which lead to my fastest lap in the last race of the day putting me into the low 50’s. I have to give a huge thank you to John Anderson for an awesome weekend and I can’t wait to get back on track with the team soon! 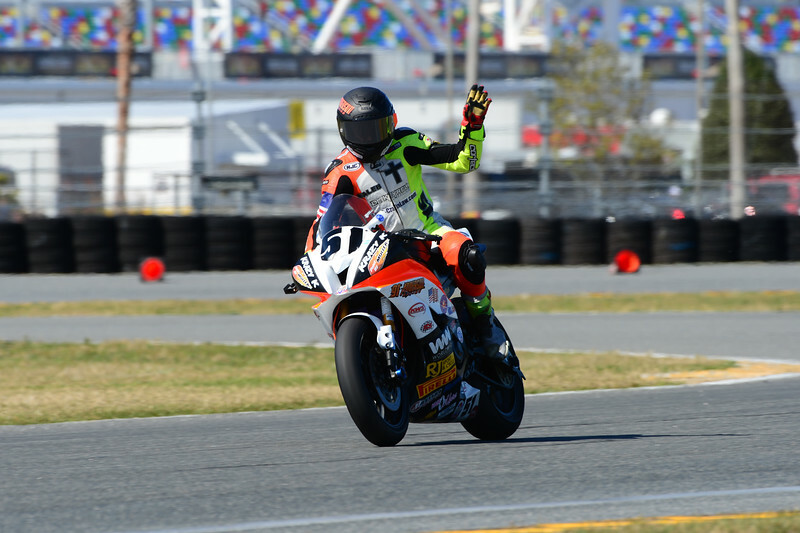 Posted in Uncategorized	| Comments Off on Kaleb De Keyrel Wins 6 races at Daytona on his Anderson Racing R6! 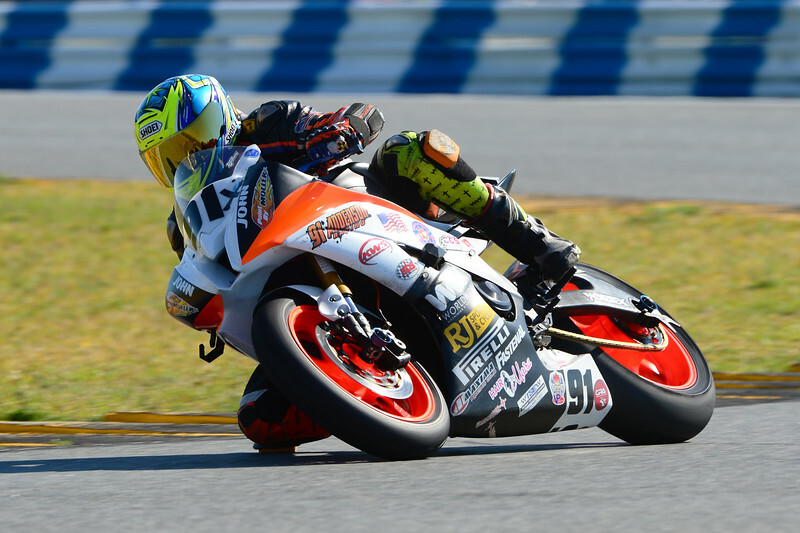 Kaleb De Keyrel and Team Worldwide gain knowledge for the Daytona 200! The weekend started off pretty relaxed compared to normal. Usually, we would slam all of our stuff into the van, pile in and head to the race. 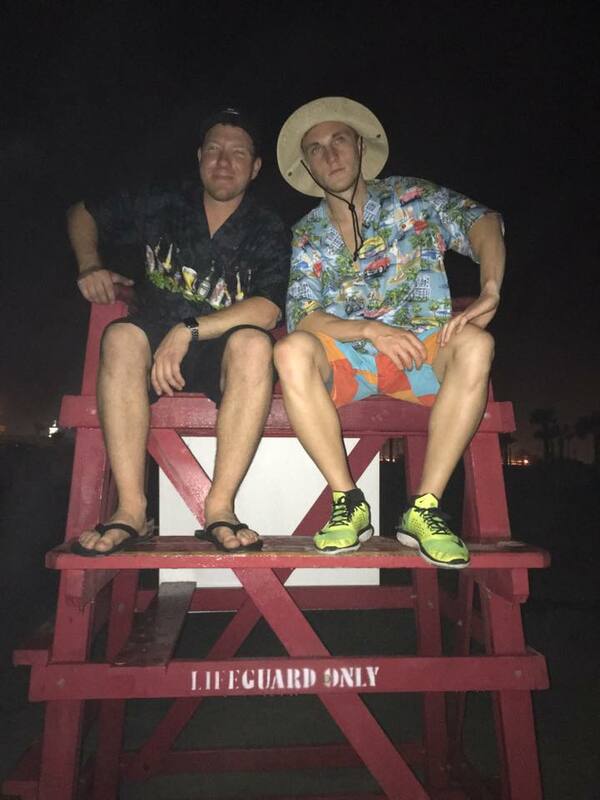 But this weekend we got there a little more glamorous…. 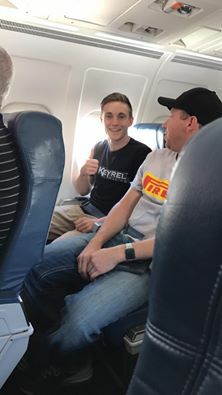 I took the short flight right to the Daytona International Airport with one of my mechanics Kody! Saw some fellow racers that were also living the luxurious lifestyle as well! We arrived at Daytona, got everything set up and our bikes all ready to role! Then, one of my fellow competitors needed a little help, so my Team Worldwide crew helped him out and brought his bike back to the hotel. 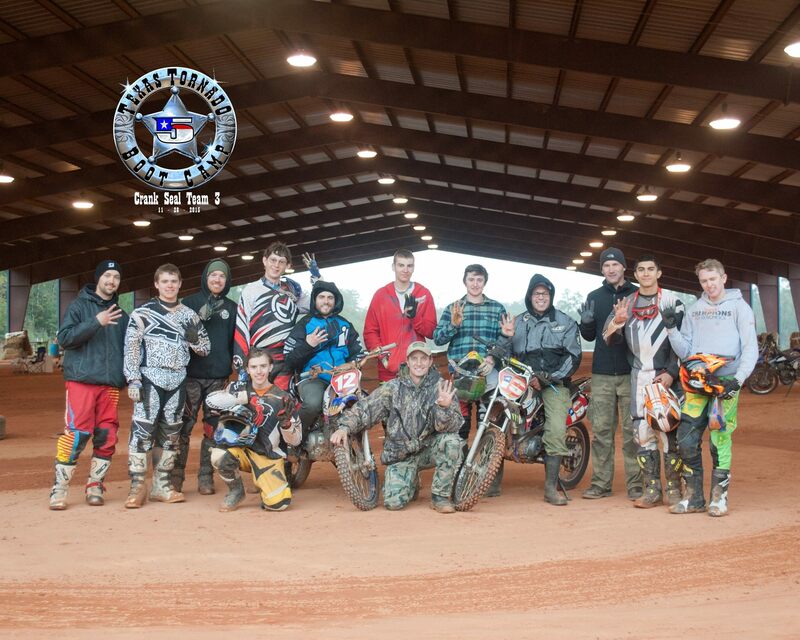 They did an awesome job getting it together that night, so it was ready for practice! The Team Hammer track day went well. We played around with different set ups all day long, but I wasn’t really happy with anything we tried. 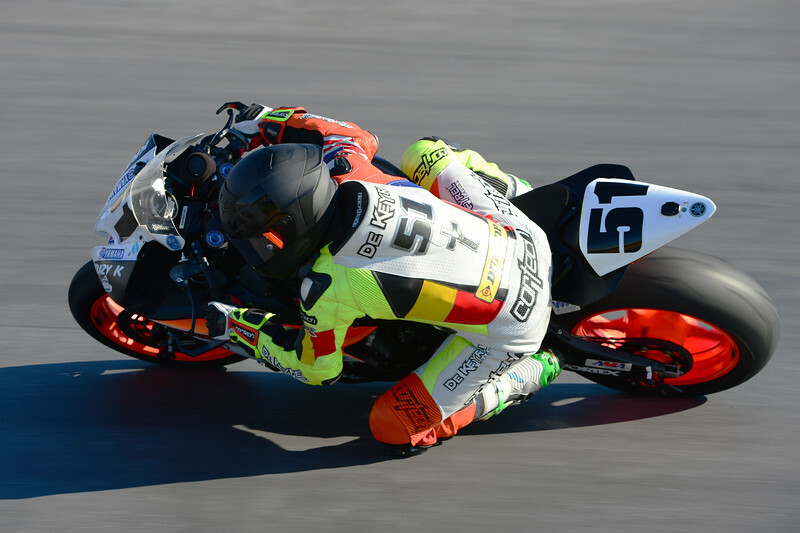 I was a couple seconds off on lap times and the bike just wasn’t doing what I wanted it to do. 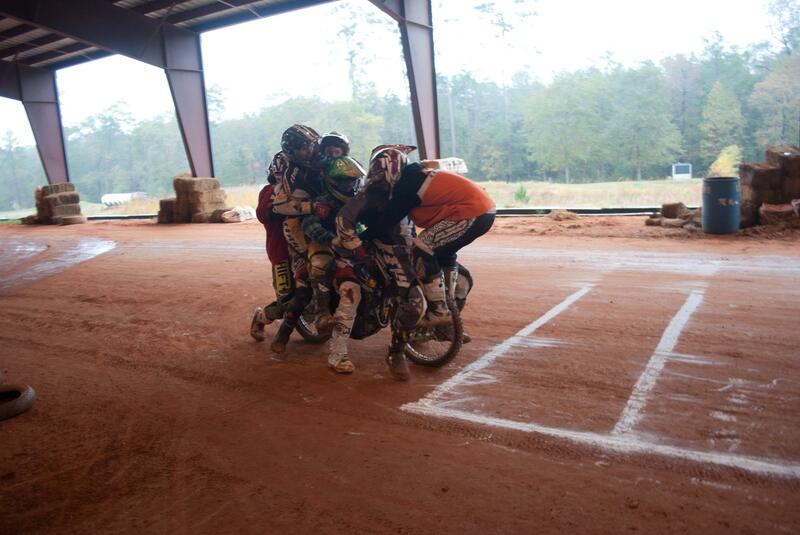 We needed to figure out what the solution was to the get the bike and lap times to where they needed to be! The first order of business on Saturday was qualifying for the ASRA on Sunday. As soon as my session was about to start, the rain started coming down and my crew worked hard to get the tires changed, but by the time they were finished there was 4 mins left in the session. I was only able to get one lap in. I qualified on the 3rd row, but I wasn’t to worried. Most people didn’t even go out, because of the weather. The main race on Saturday was yet to come. The 44 lap team challenge is the race that would give us the most data for the Daytona 200, which was one of our main goals for the weekend. 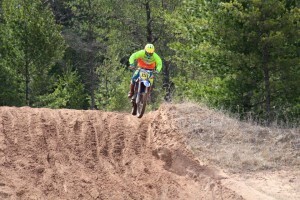 I got a great jump and was running consistent laps. I came in for my pit stop, just before half way. 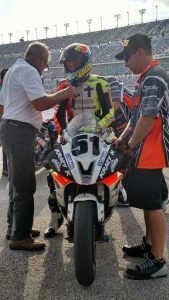 My crew fueled the bike and changed the tire as fast as they could and BOOM, I was back in the race. As soon as I got back on the track, I could tell something wasn’t right. The bike felt different, but I kept pushing. It felt like the bike was getting slower and slower. Soon after that, I was shown the red and yellow striped flag and they were franticly pointing it at me. I had to pull off the track and withdraw from the race . The corner workers said the bike was smoking. As I was rolling back into the pits, the motor shut off and I knew that the motor was done. Unfortunate end to the day, but we took the positives out of the day. 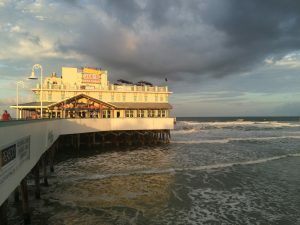 Then got some dinner at Caribbean Jack’s right on the water! Got refreshed, refueled and ready for a beautiful sunny Sunday! Sunday morning, we hit the set up right on the head. 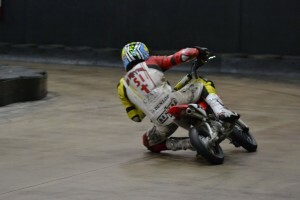 I dropped another 2 seconds a lap just like that! After practice, I went straight to church service during lunch! Raymond Rizzo had a great message and I was now ready to attack my races! First race of the day was one of the greatest battles I had in a awhile. Off the start, I jumped right up into third place and was hunting down Cody and Michael. Couple laps into the race, I saw that the leader meat balled, which means he had to pull in for a stop and go penalty. I then found myself trailing Cody. I was not far behind and just kept pushing to reel him in. I finally caught him, with 2 laps to go. I stayed right behind him on the last lap, so I could hopefully draft him to the line. Halfway around, I noticed that he was starting to slow down. I didn’t think there was anyone behind us, so I just followed. He braked checked me super hard going into the final horseshoe. I almost ran right into the back of him, so I just passed him and started to sprint to the line. Little did I realize, all this monkeying around allowed the third place rider to draft passed both of us to the line! I learned a very valuable lesson in this race and now know what my plan of attack will be in this situation. I ended up 3rd in the ASRA race. None of it really mattered though, because in all of the chaos of blowing the motor the day before. Having to switch everything over to the other bike. We forgot to put the SS air filter into the new bike. My crew worked very hard all weekend with all that had gone wrong and we now know what we have to correct in March for the 200. The next three races went great to finish up the day with two 3rd’s and a 2nd. I had such an awesome weekend working with the new crew! We only have worked together for one weekend other than this. We will continue to grow together next season and the little mistakes on track and in the pits will start to minimize. 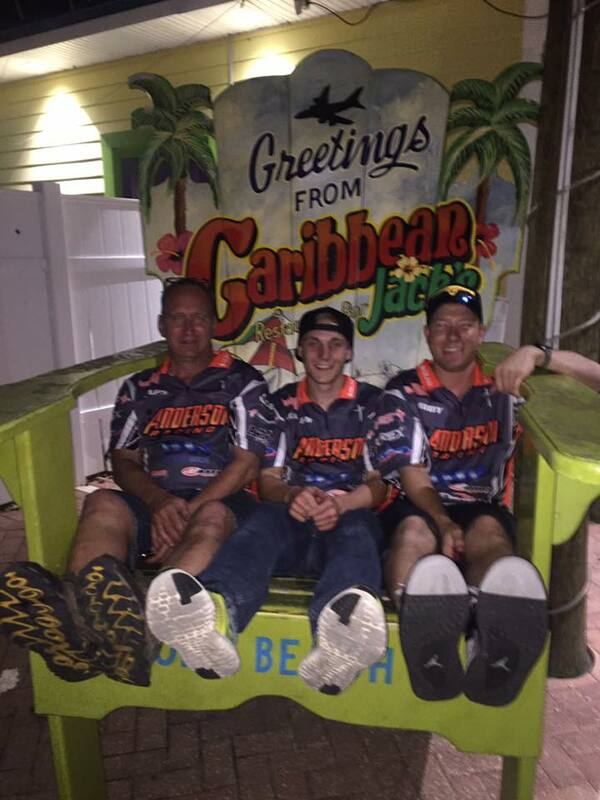 I can not thank my crew enough for how hard they worked to get me feeling comfortable and riding fast! After all the hard work was done, can you guess where we were heading? The beach! We had a fabulous dinner at Joe’s Crab Shack on the Daytona Beach Pier to finish out the weekend! I enjoyed every minute of the weekend and had so much fun with all the crew guys! Kody, Japs, John and Johnny all made this weekend a weekend I will never forget! Posted in Uncategorized	| Comments Off on Kaleb De Keyrel and Team Worldwide gain knowledge for the Daytona 200! Kaleb De Keyrel heads back to roots with Team Worldwide! I got up friday morning with my usual routine a morning jog around the facility at Brainerd International Raceway, then got stretched out and ready for an awesome day of riding the new Worldwide R6! Friday we started with a base set up we thought would be good, then just did a little fine tuning. The bike was working awesome. I just struggle a little bit on entrance on some of the really fast corners at BIR turns 1 and 2. Turn 2 was the biggest issue and also one of the fastest corners on the race track. As most of you may know, you don’t make up time in the slow corners you make of most of your time in the fast ones. So Kody, my new suspension mechanic, immediately addressed this problem and lowered the front end on the yamaha R6 to put just a little bit more weight to help the bike steer in at 150mph! This change and a couple others got me feeling right at home on this New Yamaha R6! 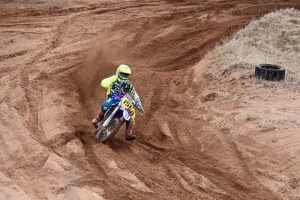 I was now anxious to start racing!! 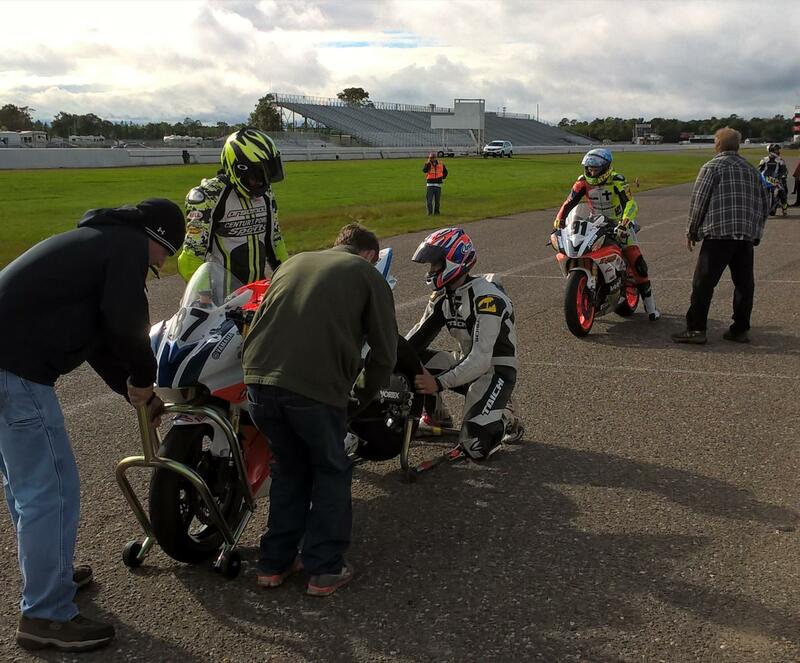 Saturday at Brainerd International Raceway, it started off rainy and would remain that way till about noon. Luckily for me, I didn’t have any races until the afternoon and it dried out just in time! I went out for the first race on this new mean machine and didn’t really know what to expect or where I would stack, being that I hadn’t raced a road race bike in a long time. 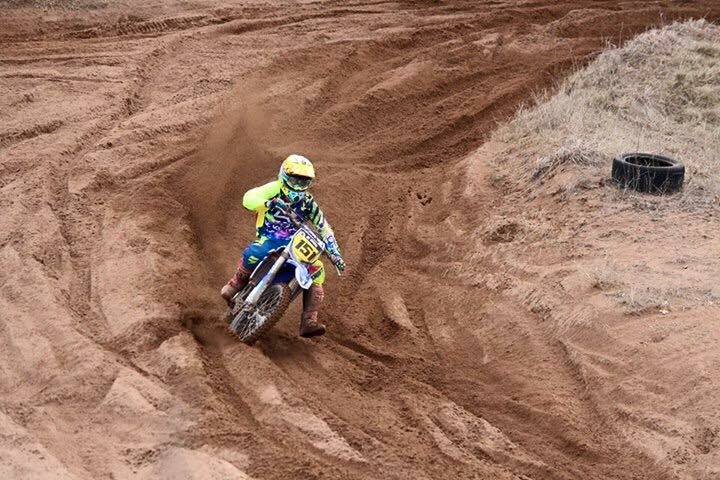 I ripped the holeshot and went into turn 3 a little cautious, not knowing if it was still wet or not. I immediately got passed by 8 guys and right after they all went flying into there, I thought to myself, huh, I probably should have went in there a little bit faster. I then just slowly started to pass them all back and pulled away with a win! I then went on to win all the 600cc and 750cc races. 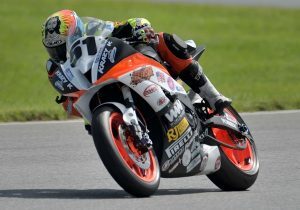 I was a little under power in both 1000cc races, but still was running up front battling and finished 3rd in both those. Overall, a really good start to the weekend and was a blast racing BIR again. Saturday night, John Anderson put on a great church service for our race family, which was very uplifting and one of my highlights of the weekend. 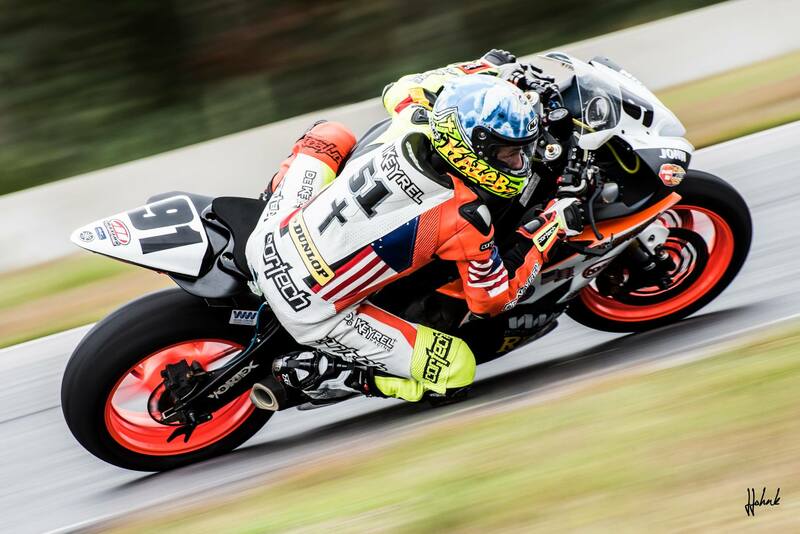 The challenges of the 5 hour endurance race are still t0 come…. Sunday, Shane Keavney, Aaron Anderson and I would race 5 hours on the 3.1 mile course of BIR. This race is hard enough to complete when the weather is sunny and beautiful, but when we all woke up on sunday morning there was a gloomy, rainy haze in the air. I knew battling the elements was going to be the biggest challenge of this whole race. I started the race with the track temp being extremely low, which as us racers would say makes the track really greasy. Although there was a little water on the track, traction was still pretty good. I jumped out to an early lead and some little back and fourth stuff with a ZX10, but quickly pulled away and started to gap the field. I continued to put down solid laps until the yellow gas light came on, then came into the pits and handed the bike off to Shane. Kody, Japs, and John our pit crew did an excellent job filling the bike and changing the rear tire. From this point on, this was quickly becoming one of the hardest races I’d ever done being that the conditions changed from dry to wet so quickly, it’s extremely hard to judge traction. Shane and Aaron did exactly what they were supposed to do in there stints and we still were in contention for the win. I hopped on after Aaron’s session was red flagged, due to rain starting to come down and big pile up in turn 4, I believe. After the restart, I put in another hard stint and gapped us from the field as much as I could. From this point on it was a cat and mouse game just feeling out the track and finding out how hard you could push in the rain, but not go over the edge. My last stint I got on and the sun was starting to come and it was actually getting to be really nice. I set the fastest lap of race during this stint and I actually thought to myself dang I’m gonna have to hand this off to Aaron then the gas light comes on soon. Right when I thought that it started raining while there was still sun in the sky. I could not believe it! So I slipped and slided my way around until the gas light came on and quite happily handed the bike off to my buddy Aaron for the final stint to finish the race! Little did he know with about 20mins to go in this 5 hour race it just started to down pour. The wind was picking up and most competitors were out there on Dots or slick tires which are not meant of these type of rainy conditions. Aaron did an amazing job keeping the bike up right and bringing Team WorldWide home the win! My teammates did a great job, but it’s not only the riders with the glory in the race. Our pit crew did an outstanding job every time we came into the pits they held their composure and did what needed to be done to get us back out into the race! 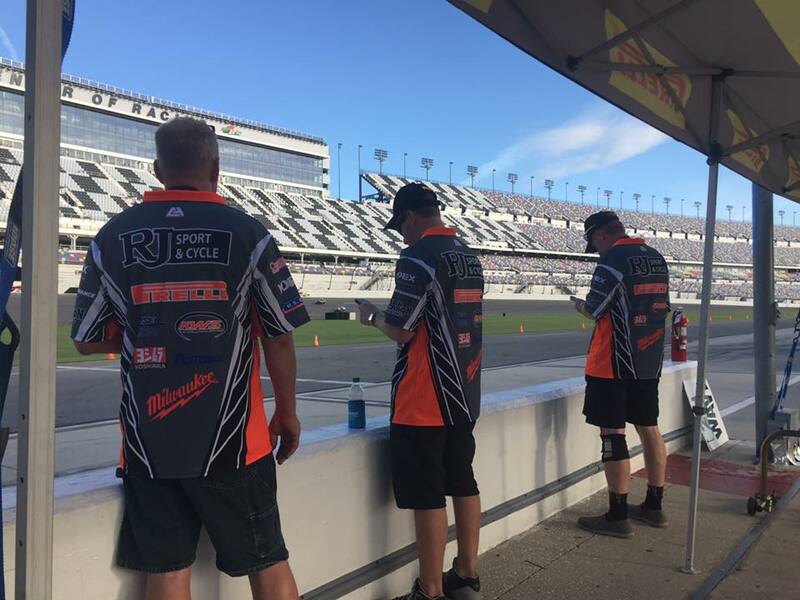 Huge thank you to Kody, James, Japs, John and Billy for their hard work in the pits! 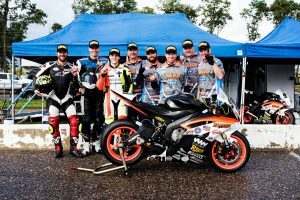 This race could not have been won without a great pit crew! I had an amazing time being back up with the CRA family and I have to give a huge thanks to John Anderson of WorldWide Machining and Welding for giving me this opportunity to be a part in such a great team! Posted in Uncategorized	| Comments Off on Kaleb De Keyrel heads back to roots with Team Worldwide! Posted in Uncategorized	| Comments Off on Kaleb De Keyrel needs your help in making one of his childhood dreams a reality! 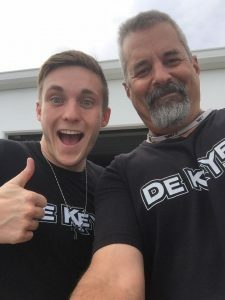 De Keyrel Racing was in Grantsburg Wisconsin last weekend with Kaleb for a district 23 motocross race and Mason was at Pro Kart indoors in Burnsville MN for a pit bike endurance race. 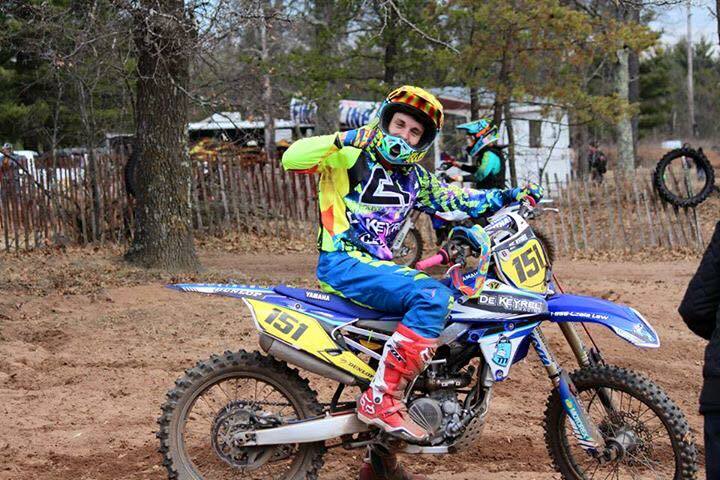 Kaleb De Keyrel raced in the 250B, Open B and 16-24 B classes of the district 23 races at Grantsburg Wisconsin. The Grantsburg track in known for its deep sand and for being very rough. Kaleb had a great day. 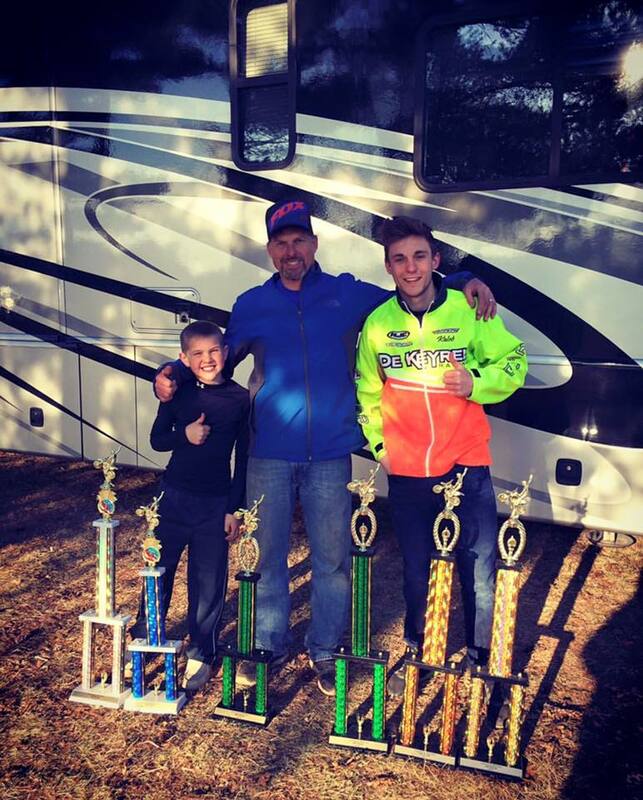 Winning all six motos and leaving the day with 3 overalls. 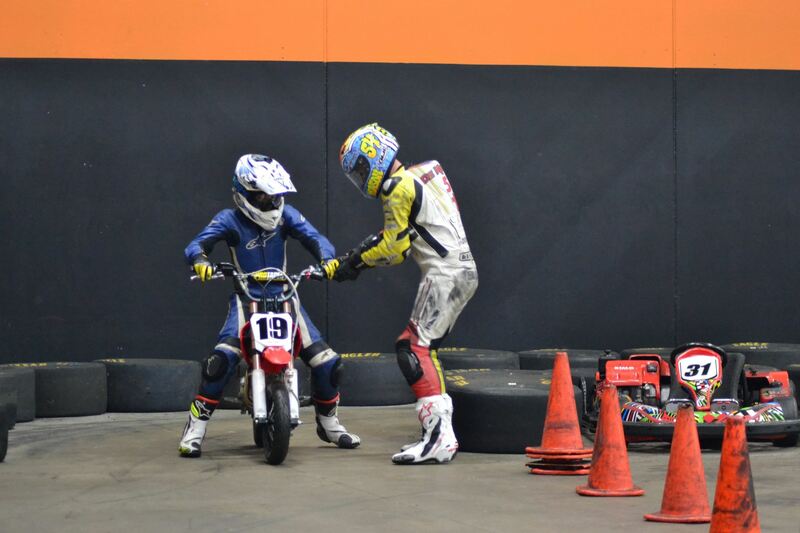 Mason De Keyrel and Nate Minster were in a two man one bike pit bike endurance race. 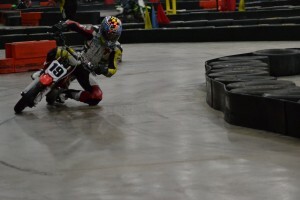 The race was held at Pro Kart indoors go kart track in Burnsville MN. 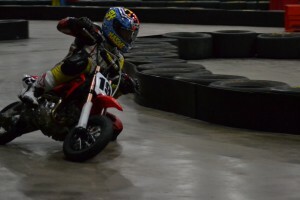 The race was open to 50cc and up bikes. 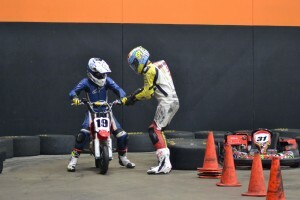 Mason and Nate were on a CRF 50 with an 88cc kit. There were bikes up to 184cc stroker kits. Mason and Nate lead the race start to finish. After an hour straight of racing. Mason took the checkered flag. It was a fun day of racing for everyone. I am trying to raise the money to pay my way. If you can help support in any way it would be greatly appreciated. You can make donations out to me directly. Thank You for taking the time to read this and for your support. De Keyrel Racing focuses on personal performance! 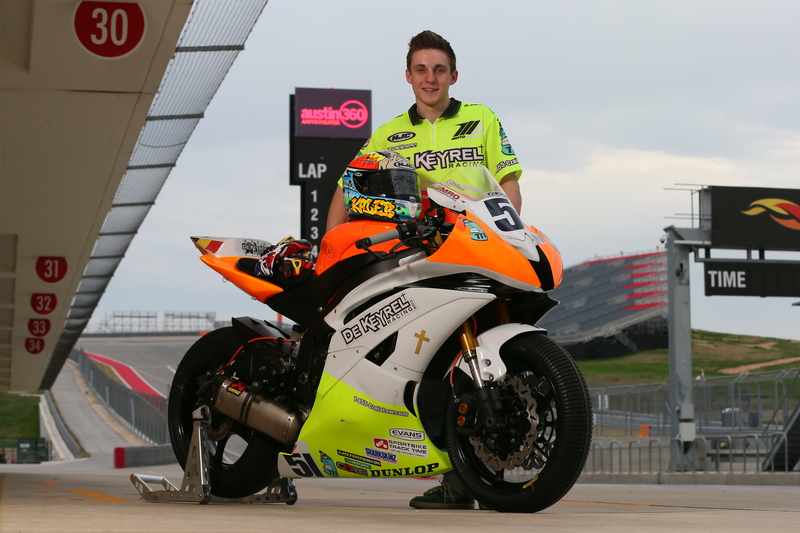 De Keyrel Racing focuses on personal performance with Bio Feed Back testing! 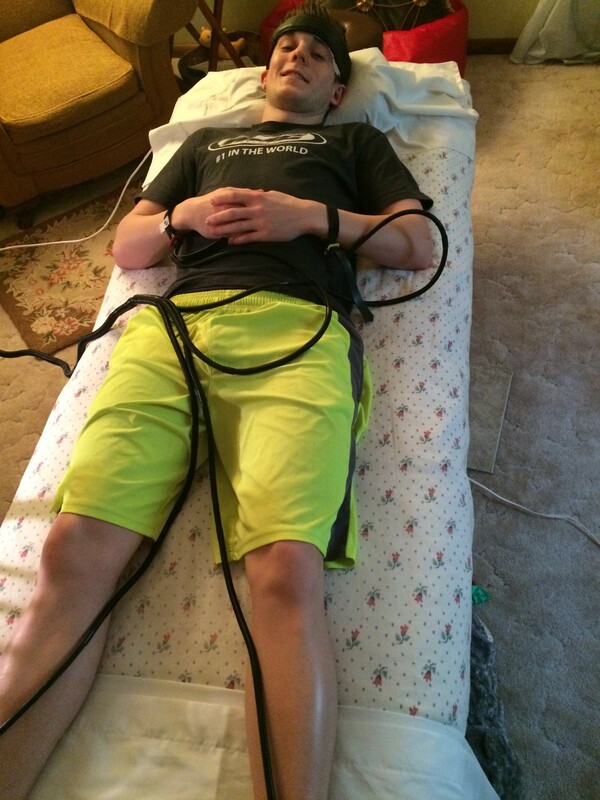 Bio Feed back testing is a process that enables an individual to learn how to change physiological activity for the purposes of improving health and performance. Precise instruments measure physiological activity such as brainwaves, heart function, breathing, muscle activity, and skin temperature. As an athlete this test will further allow you to see how well your body is truly performing. I have found out a great deal of information as to what foods my body doesn’t like. There for not to eat them before a race or at all. I also found out a couple things that I had no idea were affecting me that I can now change. I am still going through all the information learned. It is exciting. All of this will help me to further prepare for the 2016 season! 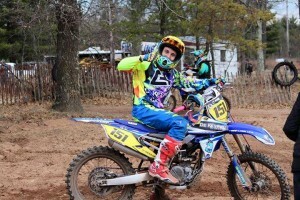 I hope all of you have had a great off season and I can’t wait to get back to racing! 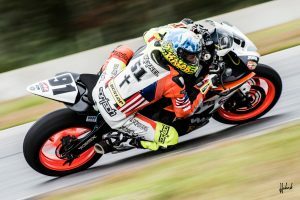 Posted in Uncategorized	| Comments Off on De Keyrel Racing focuses on personal performance! National Dizzy and Balance Center (NDBC) is a unique outpatient clinic system. They combine Physicians, Audiologists, and Physical Therapists all within the same facility to offer a true multidisciplinary approach to dizziness, balance disorders, and concussions. This multi-discplinary approach to patient care is what makes their clinics so unique for the treatment of balance disorders. 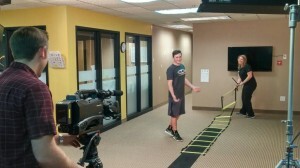 In the National Dizzy and Balance commercial they had me as a patient to show all the steps they do for concussions, balance disorders and dizziness. 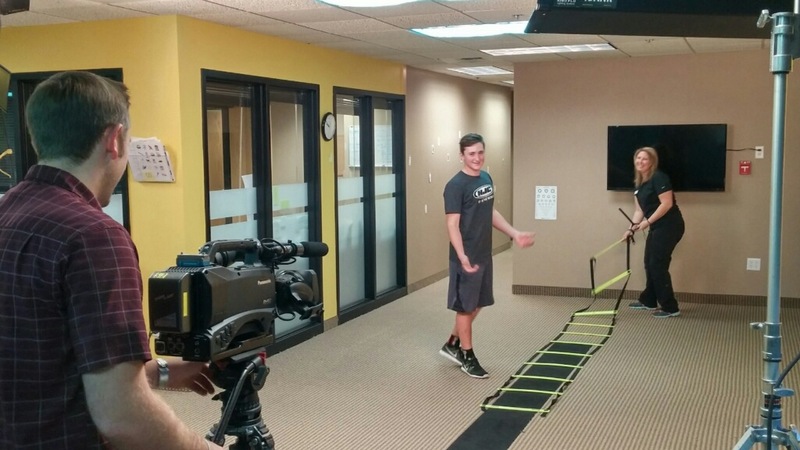 They started off with a shot where I was doing a step ladder and doing different exercises. The next shot we did, was a machine that shows what foot you put more weight on when your standing and also shows your balance. First you start off with the wall in front of you moving, if you put pressure on your heels or toes, so you want to be as still as possible so the wall doesn’t move. Next on the same machine, but the floor moves and you want to stay as still as possible, but the floor under your feet moves, so it is hard. After that, they do it with the wall moving and the floor moving, so when you put pressure on you heels or toes the floor moves and so does the wall. 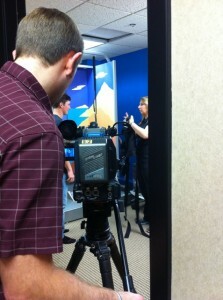 They also did a test where they make you walk down a hall and look up and down and side to side. As you walk, they look to see if you stumble. After that, a doctor looks in your eyes with a light to make sure there is nothing wrong. The doctor also makes you follow his finger as he moves it up and down and side to side. Then he starts with his finger far away and comes close to your face, if you start seeing two of his finger you tell him. 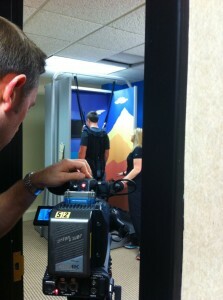 Thank you to National Dizzy and Balance Center for including me in the commercial. 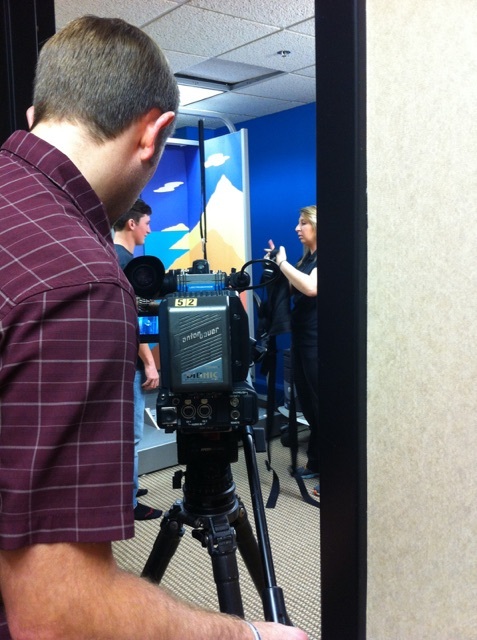 It was a great experience and I now have a new found appreciation for what all goes into making a commercial. Day1 of boot camp riding started off with a free ride. Giving everyone a chance to get a feel for the bikes and the track surface. After riding all three tracks, we went into superpole. Superpole is where they combine all three tracks into one big track and you get one lap to see how fast you can go in one lap. 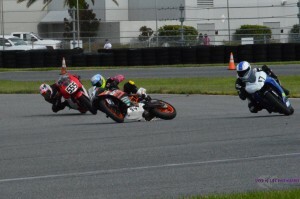 A couple of the other kids went,then it was my turn, and I made couple of mistakes in my run, but had a decent lap. I ended up getting 12th out of the 28 riders. After that, we went back into free riding all the tracks. After a while of free riding, we went into some racing. Each race had 4 riders in it and each rider had 3 heat races to try and make it into the main. if your score wasn’t good enough from the 3 heat races, you were put into an LCQ race. You had to win that race to get into the main. Day 2 of boot camp started off with free riding. After that, we went into some racing. 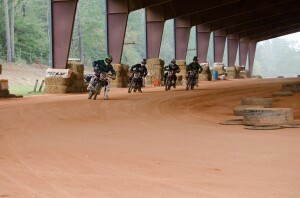 First race was on a TT type track, then we raced a small flat oval track. We did some more racing after that. After dinner, I rode late getting as much time as I could. 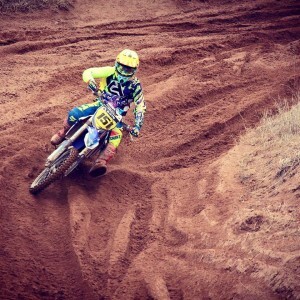 I was getting used to the track and the body positioning for this type of riding. 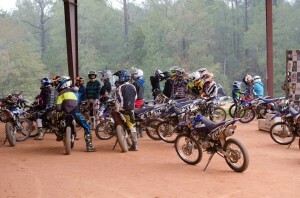 Day 3 of the boot camp started with morning free ride, then we went into some drills. One of the drills was the 90 degree drill where there were zig zagged tires down a straight and you have to go first gear and back it in around each tire. After that, we did an endurance race with our teams. We also did a drill where one rider brings all the other riders to the other side of the two lines and once all the riders are on the other side you then try to get on one bike and go from one line to the other. 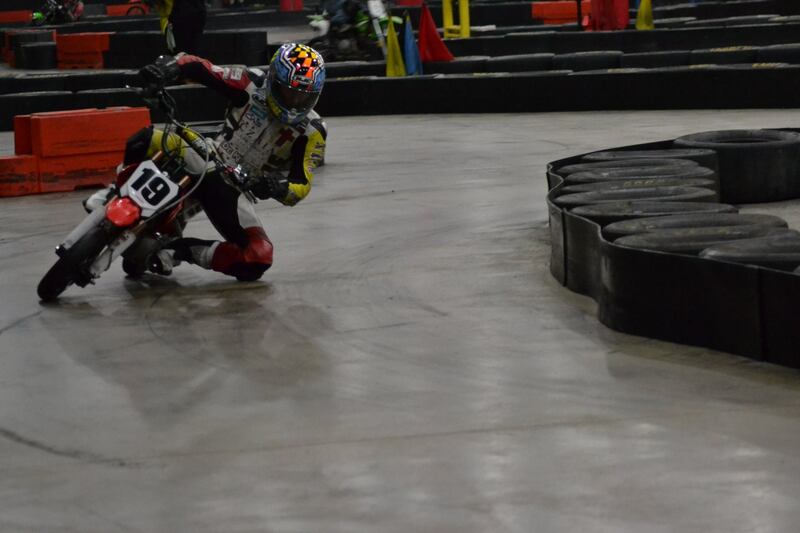 After that we did mini pole, that is one lap of the dome track and then you do a quick 180 and do the track backward. After that, we did some more racing and free riding. Super fun weekend!!!! 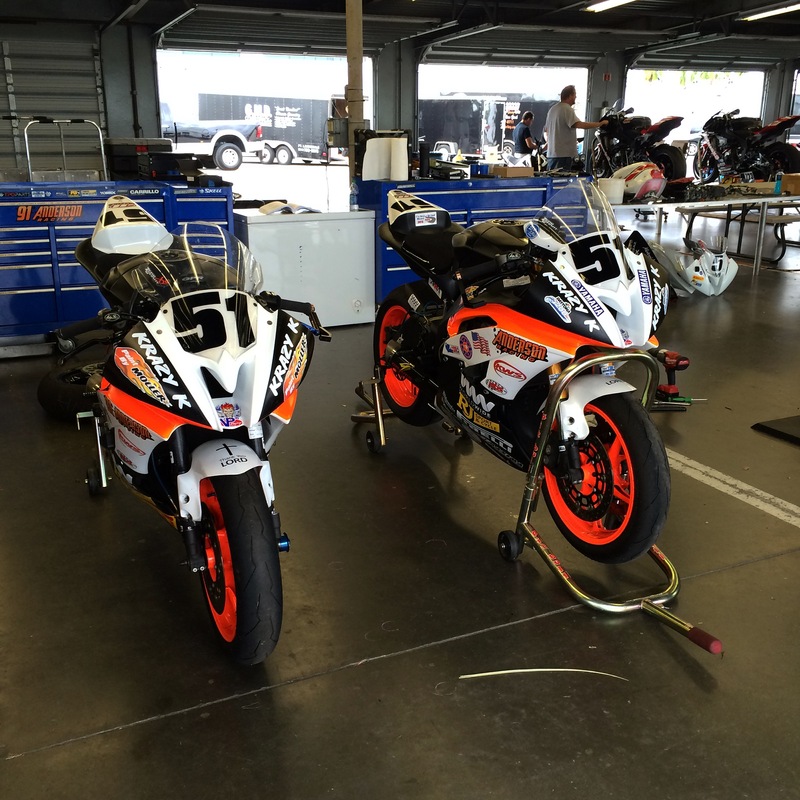 Thank you to MotoAmerica and Colin Edwards for the awesome experience. Thank you to Candace, Jimmy, and Jay Newton for a place to stay and a awesome week. First practice just went out to see what the banking was like. 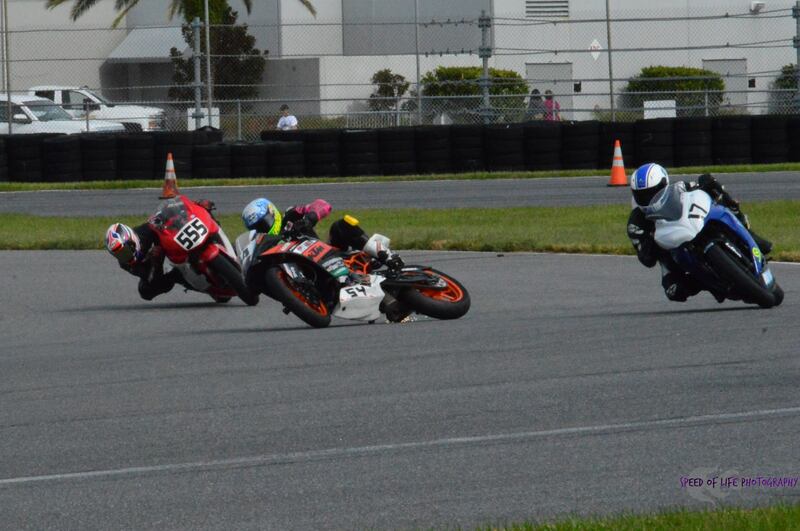 After the first lap, I knew that Daytona on a KTM 390 was gonna be really slow. After the first session, I had got used to the banking, it was way different than anything I had ever done before. Its like a straight, but you are leaned over. I had a lot of fun keeping it pinned the rest of the day. 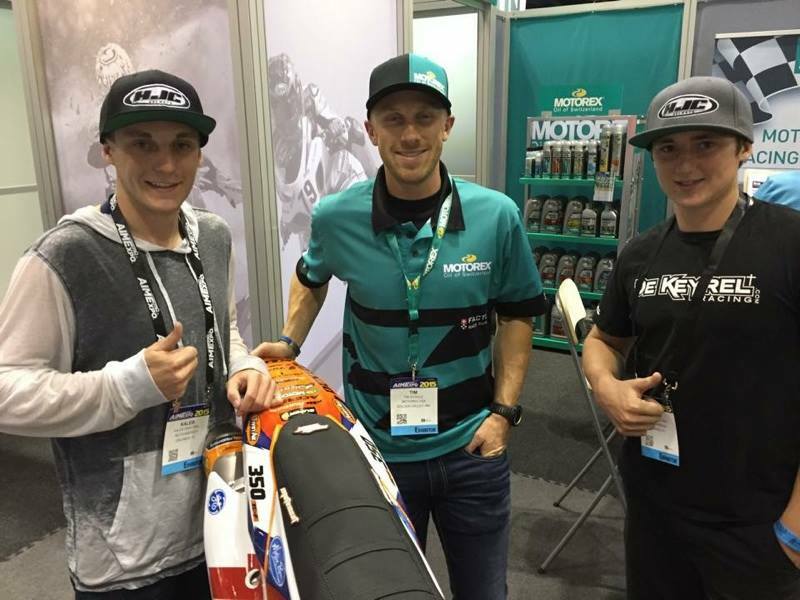 We also had a fun time at the AIMExpo. 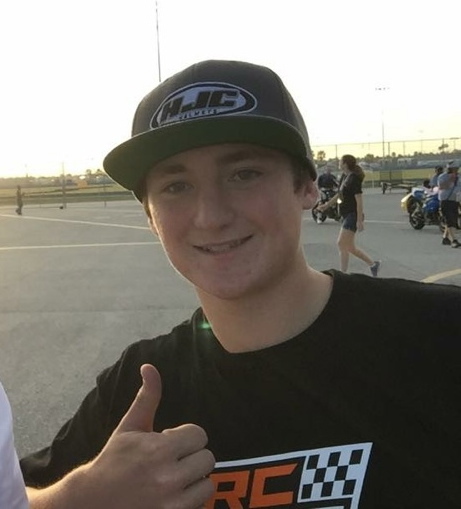 I felt good going into my second day at Daytona. My lap times were dropping lap by lap. Daytona is definitely a motor track. The bigger bike you have the more fun you will have for sure. Morning warm up I got to ride the bike I was going to run in the team challenge which was an SV650. Team Challenge started off good. My team got a decent start from the back and started working our way forward. 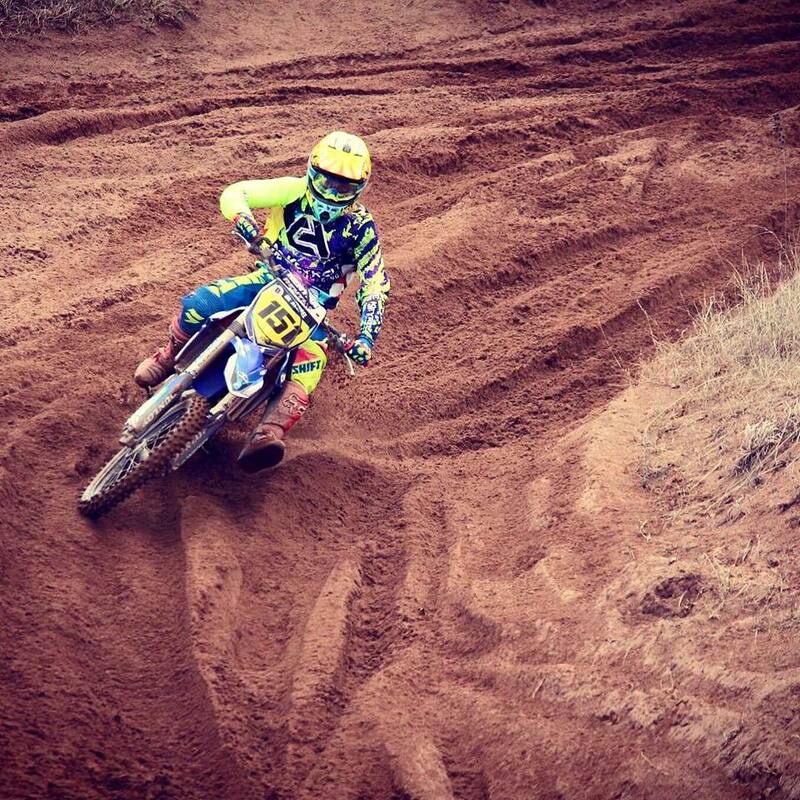 When I got on the bike, I just wanted to do consistent laps at a good pace. After the team Challenge was over we found out we ended up 4th in class. GT ultralights started 25 minutes after the team challenge. I got a decent start and was in third. I made a mistake trying to go for second and that made me loose the draft and then the race got cut short due to a red flag, so we only got 3 laps. Race 1 was 500 Super Sport. I got a good start and was in third and was trying to get into second. I finally got the draft and got into second and was battling for first. In turn 1, I was in the lead. I lost the rear and slid out. I hopped up right away trying to look at how bad the bike was and seeing if I could get back on and ride it. The right bar ended up being broke, so I couldn’t finish the race. Race 2 was Moto3. 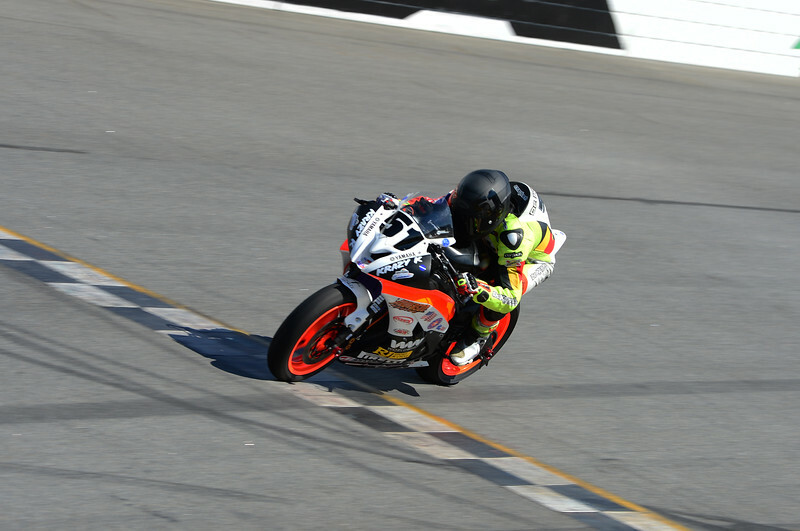 I got a good start and was in 2nd and was fighting for the lead until I got to the banking and the 125 2 strokes had way more motor than my 390, so I rode the rest of the race in 4th as the 125s pulled way. It was great to get an opportunity to race at Daytona. Thank you to CJ Czaia for having me come down. Also Huge thanks to mark from TSE for working with and helping me all weekend.